HANNAH WASHINGTON WILLIAMS (1 Jan 1814 – 1 Dec 1887) was born in Oglethorpe County, Georgia the daughter of John Williams and Lucy Young. Hannah lived with her family in various locations in Oglethorpe County as they worked to survive the challenging times of that era. The Williams were living near the Reids in the Bairdstown Militia District of Oglethorpe County where Hannah met her future husband, Bailey Reid. Although we have yet to find an official record, we believe that Hannah and Bailey were married sometime in 1828 or 1829 in Oglethorpe County, soon after Bailey sold land he drew in the 1827 Lottery. Tax records indicate that Hannah and Bailey lived in Oglethorpe County for the first 18 months of their marriage. During that time, their first child of record, son Marcus D Lafayette Reid, was born. Not long after, a second unnamed child was stillborn in 1832. Life was difficult in Oglethorpe County in that era, and providing for a young family would have been a significant challenge. Word came that there was gold to be easily found in the unsettled hills of western Georgia. Bailey had previously enjoyed good fortune in the 1827 Land Lottery. 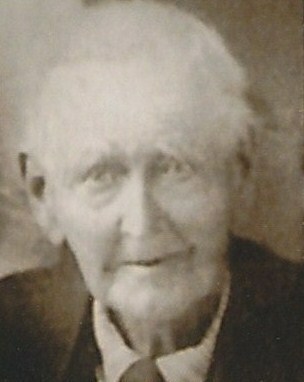 According to family records, Bailey left home in early 1833 to prospect for gold. Unfortunately, as the story goes, not long after his departure Hannah received word that Bailey had died, either in Georgia or in route to California. Widowed Hannah and son, MDL, were left to carry on alone. We’re not certain what contact Hannah and son MDL had with Bailey’s family after he left. Tax and census records indicate that Hannah and MDL lived on the Williams farm in Oglethorpe County for the next 20 years. Hannah remained single during that time, until in 1851 she began to court Benjamin Bowles, a recently widowed former neighbor now living in nearby Greene County. Hannah and Benjamin were married on 28 Dec 1851, about 20 years after Bailey had left. 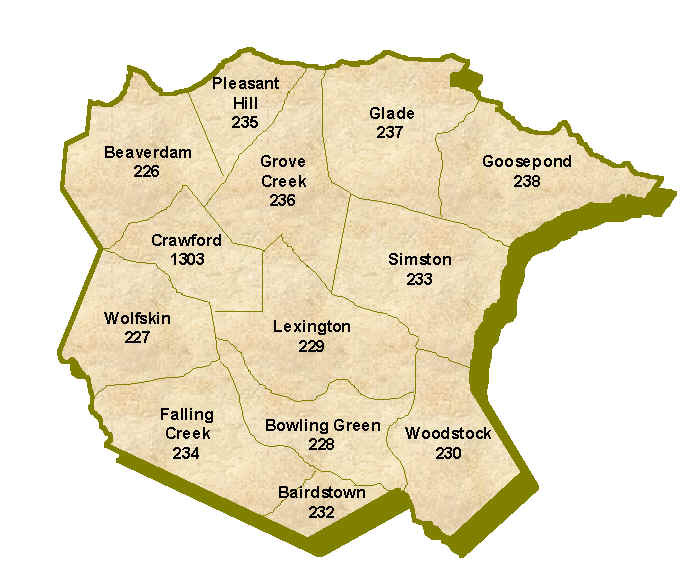 Benjamin was living in neighboring Greene County at the time of the marriage. Hannah’s son, MDL, had married the year previous, so we assume that Hannah left the Williams farm after her marriage to live in Greene County with Benjamin. We assume that MDL and his wife Nancy Ann Ramsey, stayed in Oglethorpe County and lived with her parents on the Ramsey farm. The 1860 census indicates that Hannah and Benjamin were now living in Chattooga County, Georgia, and Hannah’s brother, Harrison Williams, was also living there with them. The Civil War erupted in 1861, but Benjamin was able to avoid service in the war. Instead, we believe that Hannah and Benjamin cared for MDL’s wife Nancy and daughter Ellen while MDL was engaged in the war. Hannah’s brother, Harrison, enlisted in the Confederate Army Infantry in September and remained engaged in the war until its conclusion. While the Civil War was raging, no town in the South was safe from attack by Union troops. Sometime in early 1863 we believe that Hannah, Benjamin, daughter-in-law Nancy, and granddaughter Ellen left Chattooga County seeking refuge, and possible contact with MDL, in Floyd County, Georgia. The city of Rome, in Floyd County, had been recently fortified against possible Union troop invasion, making it a much safer and more stable place to reside. MDL had also been stationed at Bell Hospital in Rome in early 1863 to recuperate from wounds he received in battle. While recuperating at Bell Hospital, MDL learned that he was to be mustered for extended service at the hospital as a nurse. That duty would give MDL the opportunity to see family, and perhaps even spend time with them at their home, further incentive for Hannah, Benjamin, Nancy and Ellen to move to Floyd County. Regardless of the exact circumstances of her residence during the war, life for Hannah during that time must have been particularly stressful. She and Benjamin did their best to avoid the ravages of war and protect the safety of Nancy and Ellen, all while fearing for the safety of her son, MDL, and her beloved brother, Harrison. It must have been a joyous relief when the war ended and Hannah was able to celebrate MDL’s safe return. By 1870 we know that Hannah and Benjamin were living near Rome, in Floyd County, Georgia. MDL’s wife Nancy had died the previous year, and he and daughter Ellen were living with Hannah and Benjamin. Rome and many neighboring towns were recovering quickly after the war due in large part to the cotton trade. Benjamin and MDL likely worked together in the cotton trade, either on land of their own, on property they shared, or for another land owner. MDL re-married later that year. We assume that Benjamin and MDL continued to work together in a shared interest until Benjamin’s death. Hannah lived with MDL thereafter. We are not certain if Hannah was living with MDL and Nancy when they were visited by Mormon missionaries in Feb of 1877. Church records indicate that MDL and Nancy were baptized at the time of their visit. There is no record of Hannah’s baptism at that time. It is possible that Benjamin was still living at the time, and that MDL and Nancy did not live with or near enough to Hannah for her to be included in that experience. It’s also possible that Benjamin and Hannah were not interested in conversion, because there is no record of Hannah’s baptism until after her death. By 1880 Benjamin had died and Hannah was living with MDL and Nancy in Armuchee, Floyd County, Georgia. Hannah came with MDL and Nancy when they moved to Kaysville, Davis County, Utah in November, 1885. She lived with MDL and Nancy until her death on 1 Dec 1887 of issues incident to age. 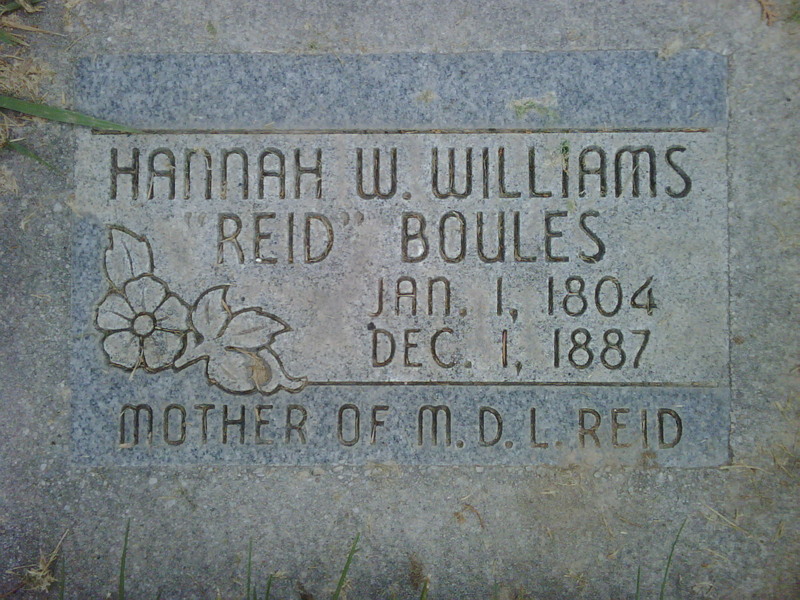 Hannah is buried in the Kaysville City Cemetery, Davis County, Utah, the 489th person to be interred there. Her grave is marked by a small concrete stone, a humble tribute to a woman of great courage and unselfishness who dedicated the majority of her life to the welfare of her only son, Marcus D Lafayette Reid, and his family. 1 Jan 1814: Oglethorpe County, Georgia, Born the daughter of John Williams and Lucy Young. Abt. 1829: Oglethorpe County, Georgia, Married Bailey Reid.